The story of Tobar Ciaran, has been handed down from generation to generation in writings, but chiefly through the oral tradition. From earliest accounts, it had been noted that a monastic settlement was established upon this hallowed ground. Shortly after the arrival of St. Patrick to our misted shores , the settlement consisted of twelve stone huts in beehive formation, in woodland surroundings, with a spring well at its center- the symbol of purity and grace. This settlement prospered for at least a thousand years, totally in accordance with the Celtic tradition of finding God’s presence in the ruggedness of nature. However, the reason for its abandonment is clouded in mystery, and yet through all of this upheaval the Holy Well still retained its Ora while it’s mystical powers were revered by those who experienced its healing charms. Even the English soldiers garrisoned nearby refused to boil or drink the water, instead located a new source, that is known to the present day as the Lieutenant’s Well. 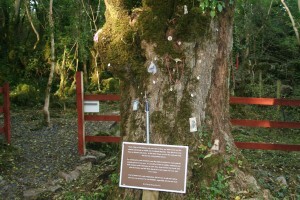 It is also noted that Tobar Ciaran bestowed great healing at the budding of the bush and the falling of the leaf. Special prayers were recited, during the visitation towards the end of July (Garland Sunday – the last Sunday in July) . Holy Water was sprinkled and gifts laid beside the Well as a reminder of its goodness and in gratitude to God. Location: situated close to Kilmactigue Church – short walk into the Holy Well via a stone laneway. 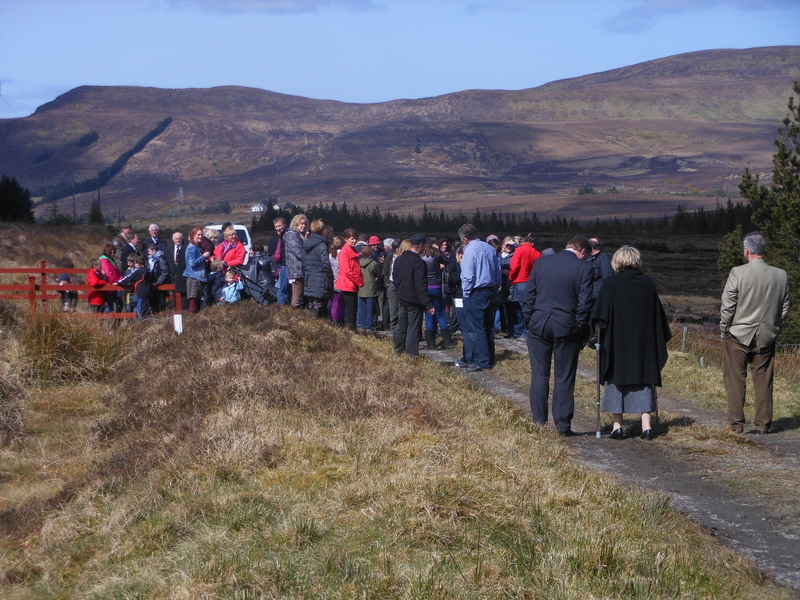 To understand how a French soldier came to be buried at this lonely spot in the middle of the Ox Mountains in Co. Sligo, we must go back more than two hundred years to that turbulent period in Irish History – the rebellion of 1798. In that year, France already a republic, was at war with England and Ireland was part of the British Empire. A secret organisation calling themselves “The United Irishmen” had long desired to bring about a revolution breaking off all ties with Britain. Wolfe Tone one of the United’s leaders spent years in France attempting to persuade the government to come to our assistance. His persuasions worked and three French warships arrived unexpectedly in Killala Bay. General Humbert with over 1,000 soldiers moved quickly to take Killala village and by that evening French and Irish Flags where flying side by side. On 23 August, 1798 Ballina was captured without a shot fired, the British Garrison having withdrawn to Foxford during the night. Over 1500 Irish rebels joined forces with the French and launched an attack on Castlebar. On 31 August the province of Connaught was declared a republic by the French with John Moore being installed as President. On 31 August Humbert and his Franco Irish army pulled out of Castlebar and marched northeast through Foxford and Swinford and onto Tubbercurry. Orders where given to 200 French Soldiers who had remained on in Killala to move eastwards towards Tubbercurry to join up with Humbert’s main force. Captain James O’Dowd with his own rebel forces led the French from Ballina out to Bonniconlon over the Windy Gap, around Lough Talt and up along the road in Gorterslin and it was here on that long-forgotten march that an unknown French soldier – possibly wounded in a previous engagement – collapsed and died. His comrades along with the local people of Gorterslin buried him at this spot. 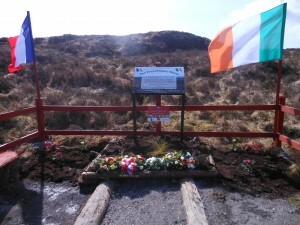 On 12th April, 2012 , after more than two centuries having gone by, the Ox Mountain Development Co. Ltd., paid tribute to this gallant soldier by inviting the French Ambassador to Ireland Mme. Emmanuelle d’Achon to lay a wreath at the burial site on behalf of the French Government and Minister. John Perry representing the Irish Government as well as members of the Irish Army and the local people of Gorterslin – laid wreaths for the unknown French soldier who so long ago lost his life on our behalf, on a bleak and windswept Irish hillside, far from the green fields of France. Special thanks to Pat O’Connor, Lough Talt, Co. Sligo. Location: Turn off on the R294 shortly after Joe Dan Mullarkey’s Pub, Mullaney’s Cross. No cars allowed – short walk up to the burial site.